Organovo’s 3D printed mini liver just shattered its own record, carrying out the same cellular functions as a natural human liver for 40 days in the lab. That may not seem like a lot, human liver cells are replaced about every 300 to 500 days, but the company’s previous millimetre sized liver slivers only managed five days. The trick: Organovo uses the same mix of hepatocytes (the cells that carry out liver functions) and endothelial cells (which form the liver’s architectural support) found in nature, leading cells to develop more naturally than other experiments that used only the functional cells. 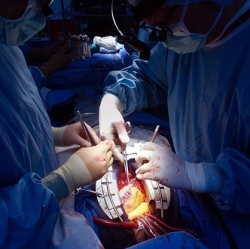 It’s a small but significant step for the more than 120,000 people on organ transplant waiting lists worldwide.